HOLLYWOOD, CA: Actress Barbara Eden arrives at the Premiere of Warner Bros. Pictures' 'New Year's Eve' at Grauman's Chinese Theatre. Photo taken on Monday, December 5, 2011 by Tom Sorensen/Moovieboy Pictures. HOLLYWOOD, CA: Actress Jackie Seiden arrives at the Premiere of Warner Bros. Pictures' 'New Year's Eve' at Grauman's Chinese Theatre. Photo taken on Monday, December 5, 2011 by Tom Sorensen/Moovieboy Pictures. 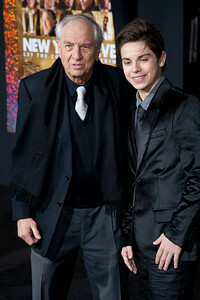 HOLLYWOOD, CA: Director Garry Marshall and actor Jake T. Austin arrive at the Premiere of Warner Bros. Pictures' 'New Year's Eve' at Grauman's Chinese Theatre. Photo taken on Monday, December 5, 2011 by Tom Sorensen/Moovieboy Pictures. HOLLYWOOD, CA: Actress Hilary Swank arrives at the Premiere of Warner Bros. Pictures' 'New Year's Eve' at Grauman's Chinese Theatre. Photo taken on Monday, December 5, 2011 by Tom Sorensen/Moovieboy Pictures. 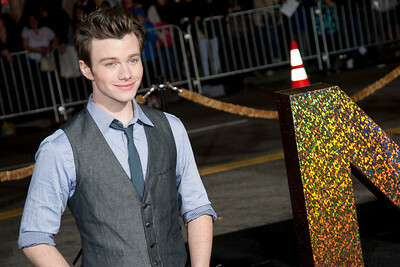 HOLLYWOOD, CA: Actor Chris Colfer arrives at the Premiere of Warner Bros. Pictures' 'New Year's Eve' at Grauman's Chinese Theatre. Photo taken on Monday, December 5, 2011 by Tom Sorensen/Moovieboy Pictures. HOLLYWOOD, CA: Actress Abigail Breslin arrives at the Premiere of Warner Bros. Pictures' 'New Year's Eve' at Grauman's Chinese Theatre. Photo taken on Monday, December 5, 2011 by Tom Sorensen/Moovieboy Pictures. HOLLYWOOD, CA: Actress Katherine Heigl arrives at the Premiere of Warner Bros. Pictures' 'New Year's Eve' at Grauman's Chinese Theatre. Photo taken on Monday, December 5, 2011 by Tom Sorensen/Moovieboy Pictures. HOLLYWOOD, CA: Singer Stacy Ann Ferguson aka Fergie and Actor Josh Duhamel arrive at the Premiere of Warner Bros. Pictures' 'New Year's Eve' at Grauman's Chinese Theatre. Photo taken on Monday, December 5, 2011 by Tom Sorensen/Moovieboy Pictures. HOLLYWOOD, CA: Actress Sofia Vergara arrives at the Premiere of Warner Bros. Pictures' 'New Year's Eve' at Grauman's Chinese Theatre. Photo taken on Monday, December 5, 2011 by Tom Sorensen/Moovieboy Pictures. HOLLYWOOD, CA: Actress Kasia Wolejnio arrives at the Premiere of Warner Bros. Pictures' 'New Year's Eve' at Grauman's Chinese Theatre. Photo taken on Monday, December 5, 2011 by Tom Sorensen/Moovieboy Pictures. HOLLYWOOD, CA: Actress Lea Michele and Actor Ashton Kutcher arrive at the Premiere of Warner Bros. Pictures' 'New Year's Eve' at Grauman's Chinese Theatre. Photo taken on Monday, December 5, 2011 by Tom Sorensen/Moovieboy Pictures. 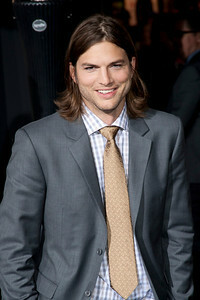 HOLLYWOOD, CA: Actor Ashton Kutcher arrives at the Premiere of Warner Bros. Pictures' 'New Year's Eve' at Grauman's Chinese Theatre. Photo taken on Monday, December 5, 2011 by Tom Sorensen/Moovieboy Pictures. HOLLYWOOD, CA: Actress Lea Michele arrives at the Premiere of Warner Bros. Pictures' 'New Year's Eve' at Grauman's Chinese Theatre. Photo taken on Monday, December 5, 2011 by Tom Sorensen/Moovieboy Pictures.